If you’re a foodblogger, do you sometimes find that you cook more for your blog than you do for your friends? Well, I was clearly doing that on Friday. What was I thinking? The below menu for two people? Please, feel free to laugh. That’s what I did! You can see what I planned and then what really happened. Spicy carrot tortellini with lemon-cumin sauce– a hit! Spoon lamb (see below) – FABULOUS! But, honestly, this lamb was amazing. I’ve never made lamb before and this could not have been easier (most of the time is spent with the lamb in the oven). I was a bit apprehensive because I know that lamb is fatty, but this recipe came out not only exquisitely tender (hence the name “spoon lamb”), but the fat cooked off into the braising sauce, and you then skim it off after refrigerating. For a first attempt at a recipe, this was incredibly rewarding. The recipe is adapted from Ana Sortun’s Spoon Lamb in “Spice: Flavors of the Eastern Mediterranean,” as quoted in Julia Moskin’s NYT article entitled, THE CHEF: ANA SORTUN; Spices by the Handful, Not by the Pinch” (June 14, 2006). The main modification I made is that I halved the recipe, and have reflected that in my quantities here. I did however keep the amount of vegetables the same. Time: 3 hours plus at least 1 hour’s chilling. Serves 2 with lots and lots of leftovers. Rather than using multiple pots and pans (the original recipe calls for at least one skillet and a roasting pan), I made the entire dish in a single large deep Calphalon skillet that went pretty easily from stovetop to oven. I covered the plastic-coated handles in aluminum foil to protect them in the oven. Heat oven to 325ºF. Heat oil in a large skillet over medium-high heat. Add lamb chops and brown on both sides, about 4 minutes a side. Remove chops to a plate. Pour off any fat from skillet and deglaze with 1/4 cup red wine, scraping up browned bits. Replace chops in skillet roasting pan and sprinkle cumin over lamb. Add garlic, carrot, onion, remaining 1 cup wine and enough water to reach halfway up chops (I always add a bit extra water, actually reaching about 3/4 up the chops). Cover with two sheets of aluminum foil and seal tightly with lid of skillet. Braise in oven 2 1/2 hours, until falling off bone. In a skillet big enough to hold lamb (I used the same one that I initially browned the lamb chops in), simmer liquid until reduced by about half and thickened but not syrupy (~7 minutes). Stir in pomegranate concentrate and margarine, and season with salt and pepper. Squeeze in one lemon half. Taste and add more lemon and salt, if necessary. Reheat lamb and carrots in sauce over low heat, turning occasionally, for 10 minutes. Serve, sprinkled with mint, if desired (I forgot), and with rice. A special thank you to Anu from Swirl Savvy for some last minute wine tips, and the staff at the Butcherie for their assistance in choosing three beautiful bone-in shoulder chops for this dish, explaining how to identify quality cuts with a good ratio of meat, bone, and fat (beginning to redeem themselves via quality customer service, despite some of my initial reservations about their hours). I’ve been back from vacation in Panama for several days and have just resigned myself to admitting that I will be backdating my blog posts for a while because I like having a chronological record of what I’ve been up to, but I can’t resist posting the new things that I’ve been cooking or experiencing. So, it’s cheating a little bit, but I’m admitting it outright…and I’m being fully transparent. It’s my blog and I’ll backdate if I want to! Ok, needless apology over, let’s move on. One of my favorite foodbloggers is Sarah over at FoodBridge. When I joined FoodBuzz a few months ago, she was one of the first “friends” I made and we have developed a consistent dialogue over our blogs and Twitter despite the physical distance that separates us. I’m always inspired by the food she makes, the history she collects about dishes and ingredients and her friends and neighbors, and her daily adventures in the markets, beaches, and nature in one of my favorite countries and its surroundings (and the recipes she discovers from friends made along the way). And her judo-attired son bakes cookies and cleans up! I have been thinking about the Moroccan Carrot Ravioli with Lemon Zest and Harissa that Sarah made a few weeks ago, and last night was the night to finally make this dish. The main food I had in my kitchen was a bunch of CSA greenery (parsley, cukes, scallions) that would lend themselves nicely to a big Israeli-style salad when added to a few tomatoes and olives, garlic scapes (ooh, I can’t wait to make Dorie Greenspan’s scape pesto), and a pound of carrots (but no onions which I would have needed if I wanted to make a soup). I also dug around and found some schug in the fridge (which I often substitute for harissa in a pinch because the commercially available schug in the US is very similar and made with red chili peppers though the authentic Yemenite version is made from hot green peppers and cilantro) and a package of wonton wrappers in the freezer. Given that my pasta maker is at my parents’ house and is too heavy to reasonably ship (yes, when I was in 6th grade and we had to prepare a meal for our families and write it up to learn how to give clear directions, I, the annoying over-achiever, managed to prepare steak, homemade pasta, and chocolate chip pound cake in comparison to classmates’ PB&J sandwiches…), the wonton wrappers would have to do. As a lazy and hungry foodie, I use wrappers all the time. Now, Sarah incorporated her spicy harissa into her pasta dough, but I couldn’t since I was using wontons, so I decided to make a spicier filling, pilfered from Ana Sortun’s Oleana restaurant. If you live in Cambridge, Boston, or within a 100 mile radius, a visit to Sortun’s restaurant or cafe is de rigueur — check out what my friend and fellow blogger, Jess wrote about Oleana and Sofra over at Sweet Amandine. The overall recipe and sauce are inspired by Sarah Melamed’s Moroccan Carrot Ravioli with Lemon Zest and Harissa. The filling is just barely modified from Ana Sortun’s Spicy Carrot Puree in “Spice: Flavors of the Eastern Mediterranean,” as quoted in Julia Moskin’s NYT article entitled, THE CHEF: ANA SORTUN; Spices by the Handful, Not by the Pinch” (June 14, 2006). The filling is easy to make and most of the time is spent away from the kitchen as the carrots cook or letting the flavors co-mingle. Plus everything is made in one pot! Wonton wrappers when boiled allow the bright orange filling to shine through and the sweet-spicy mix picks up the acidity in the fresh squeeze of lemon in the sauce/dressing. This sauce was inspired by the lemon zest that Sarah put in her filling. Boil carrots until very tender, about 20 minutes. Drain and return to pan, tossing over medium heat until dry. Coarsely mash with potato masher or fork. Stir in remaining ingredients and set aside for 30 minutes to let flavors blend. Season, transfer to bowl, drizzle with more olive oil and serve with crusty bread, if desired. Or, use as tortellini or other pasta filling. Once you get the hang of it, making the tortellini by hand is pretty quick and easy.You want to keep the wrappers from drying out so that they won’t crack, so only peel them from the stack one at a time and keep the rest in the packaging or under a barely moist paper towel. Hold a wrapper in your hand and spoon ~ 1 heaping t of filling into center. Dip your index finger of the other hand into the bowl of water and moisten two edges of the wrapper. … and then bring the two long corners together opposite of the other corner, sealing with another dab of water to form a tortellini. Repeat with the remaining wrappers (I made 10 for myself). Carefully drop tortellinis into salted boiling water, lower heat, and simmer for ~ 5 minutes. This is enough sauce for 1 serving – modify as appropriate. I’m not sure if it’s technically called a sauce if it’s not cooked … perhaps this is just a dressing. Mix all ingredients and pour over warm pasta. I served the pasta with a simple salad of red leaf topped with hummus, za’atar, extra virgin, salt and pepper, and whatever lemon juice was left over from the lemon half that didn’t go into the sauce. If you want to make your own harissa, check out Sarah’s recipe. One of my main rules of cooking is that I never make anything that I don’t like. And I have never liked anything with an anise flavor. Never. I have even returned dishes in restaurants if they have too strong of a tarragon or anise basil seasoning. A few years ago, I overheard my friend Naomi saying, “don’t yuck someone’s yum.” A pithy little phrase, but one that I sometimes have difficulty following. However, writing here has taken my cooking and exploration of food to a new level, and is an opportunity to check out things that I have not normally been particularly keen on. So, when I went to a cooking demonstration at the Cambridge School of Culinary Arts last week, I was thrilled to discover that of the dishes made, my favorite was a fennel and pistachio salad. Janna Gur, the Chief Editor of Al HaShulchan, Israel’s monthly foodie magazine, taught the course and took the participants on a gastronomic tour of Israel. Woven throughout the demonstration were pictures and anecdotes of Israel’s progression from a literal culinary wasteland in the 1980s when Gur was an El Al flight attendant, carrying oranges from Florida and olives from Greece, to its current reclaiming of its historical title, “eretz chalav u’dvash” — the land flowing with milk and honey. Today you can find groves of pomegranates. A rich melting pot of Ashkenazi and Sephardic Jewish, Arabic, Mediterranean, and North African flavors and influences. Wineries rivaling those in France. Classics reinvented like Turkish malabi, a pudding made with rose water, turned into a rosewater-topped cheesecake. Over the next few weeks, I plan to devour the cookbook that Gur signed for me and, given the success of the fennel salad, I can’t wait to try more recipes. Adapted from Janna Gur’s The Book of New Israeli Food: A Culinary Journey. There must be some chemisty (magic?) involved in the technique of submerging the cut fennel in ice water and then mingling with lemon suprêmes (in Israel, apparently these are called “fillets”) before adding a honey-based dressing with a little kick from a hot pepper. Whatever it is, I was determined to recreate the recipe as soon as I could buy some fennel for the first time in my life! Coming from an anise “yucker” that’s saying a lot. Perhaps my taste buds are changing. [For example, recently I bought some Absenthe on a whim and found it not altogether distasteful. And I did not have more than a few sips, so I can’t blame my judgment or lack thereof on la fée verte.] Or perhaps, Janna Gur and Erez Komarovsky are just that good. I’m betting on the latter. If the acid in the lemon is too strong for you, try some Granny Smith apple, sliced into thin segments to provide tartness with less acidity and keeping with the color palette. Add a splash of lemon juice to prevent the apples from turning brown. Cut the fennel bulbs in half and then into thin longitudinal slices. Soak in ice water for about 30 minutes (I just stuck in a bowl of cold water and then in my freezer). While soaking, roast pistachio nuts in 350ºF for about 10 minutes and allow to cool. Drain and mix the fennel slices with the lemon segments (reserve juice for later). Sprinkle coarse sea salt on top and set aside to rest for 15 more minutes. Mix fennel and lemon salad with olive oil, hot pepper, and honey. Add nuts immediately before serving. I had a little bit of leftover salad and, after marinating for 2 more days, it was great thrown on baby mixed greens with a few more roasted pistachios. ** DOCTOR’S NOTE: Proceed with caution due to the recent salmonella scare and recall associated with pistachios. Roasting is supposed to kill the bacteria, and I always roast nuts myself. Do what makes you comfortable in this respect. The salad can obviously be made without pistachios. Try pinenuts instead. From Janna Gur’s The Book of New Israeli Food: A Culinary Journey. I have not yet tried to make this salad at home, but it was also excellent (but I like beets!). Boil beets in water until tender. Cool, peel, and cut into a very small dice. Mix with the pomegranate concentrate, lemon juice, peppers, and coarse sea salt. Set aside for ~15 minutes. Mix the salad with the cilantro leaves and pomegranate seeds. Pour olive oil on top and serve. Most cheese should be brought to room temperature for a few hours before serving. And when I think about brie and Camembert (and clearly I think about Camembert more often than I eat it), I envision it as an off-white slice leaking out of a snow-white rind, almost melting and oozing easily onto a cracker ready to receive its runny mild flavor. To the best of my knowledge, few people in the US store cheeses on the counter, so they rarely get to the point of stinkiness as in France, but our obsession with refrigeration prevents us from really enjoying and exploring the full palate and joy that cheese can bring. One exception is baked brie. This is one of the easiest and fanciest-looking foods for entertaining and has become one of my signature dishes over the past few years when I made a few tweaks to tradition preparation. When most people hear “baked brie” they think of brie en croûte – a round of cheese slathered with preserves, typically apricot or raspberry, or maybe some dried cranberries and then wrapped in puffed pastry and baked. This is good but, in my mind, a bit too overdone. The main trick to brie en croûte is to use a good puff pastry and to cook at a pre-heated oven at a high heat, ~425°F for 15-20 minutes until the pastry is golden brown. That’s it. Super simple. Of course, I can’t really leave simple alone. When I do make this type of baked brie, I typically caramelize slivered almonds to cover the brie with before wrapping in a puffed pastry crust. Just different enough to get a few surprised looks. I remember making this for my friends Adam and then pregnant Pamela, who was thrilled when we realized that unlike French brie made with raw milk, in the US, brie is made with pasteurized mik, so she could indulge freely. For my birthday 2 years ago (when I served “A Taste of Europe in Manhattan” for over 50 guests…NOT TO BE REPEATED without a serving and clean-up crew! ), I experimented and came up with a slightly savory baked brie dish. It obviated the need for the puff pastry shell, using the natural rind to contain the oozing cheese and baked directly in the round wooded box, creating a unique flavor and presentation that preserved the essence of the brie. This is potentially also slightly lower in calories (since there is no puff pastry). But, let’s be real. Once you’re talking about double écrémé cheese (almost 50% butterfat!) the only way to pretend you’re cutting calories is by moderation. Small portions — just un petit goût as the French might say, a little taste, a few forkfuls. But this stuff is so good, you might need to hide it from yourself! I made this dish for my parents when they came to spend Rosh Hashanah, the Jewish New Year, with me soon after I moved to Cambridge last year. My father has been requesting the recipe for months so that my mother will make it for him (most of my father’s cooking is relegated to the grill…). So, here are the long overdue, step-by-step directions. Caramelized onions adapted from Mark Bittman’s How to Cook Everything. I make these caramelized onions into almost a confit to spread in the middle of the brie. I use a 2-pound Président Brie that I have only ever found in Zabar’s in New York (see Resources) because it comes in a nice wooden box. Président Brie in box; tablet K hechsher, labels for slices, "keep refrigerated"
This is definitely a party-sized recipe, but this recipe can be halved for if you want to make a 1-pound Brie (though the onions are pretty good and you should make the whole recipe, reserving the onions to serve warm on the side or for another use). Even if the cheese does not come in a wooden box, you can bake on foil and the rind should contain the cheese pretty well. In order to slice the Brie in the middle lengthwise, freeze the cheese for about 30 minutes while preparing the onions, and then score with a knife and use dental floss to evenly cut the Brie through to the center. Preheat oven to 350ºF (You may be able to cook this at a higher temperature for a shorter amount of time, but I have always made it at 350). Place wrapped Brie in freezer (~30 minutes) for easier slicing later. Prepare caramelized onions. Slice onions into very thin half- or quarter-rounds. Saute in olive oil or oil/butter mix over medium heat for ~15 mintues until start to brown. Add sugar and water and raise heat to medium high. Cook, stirring frequently until the onions are shiny and continue to darken, and the liquid is almost evaporated, ~ 10 more minutes. Add balsamic and cook additional 5 minutes until onions are dark brown and syrupy. Taste and add salt if necessary (the salt brings out the sweetness in the onions and give an extra bit of savory to the mix). Remove brie from freezer and unwrap. Score cheese all the way around with a knife. Then wrap dental floss around the cheese, cross the ends, and pull so that the floss slices through the cheese evenly, cutting it into two pretty even halves. Place one half in wooden box bottom, cover with onions, and top with the other half of the cheese. I like to score the top of the rind so that some of the cheese will bubble through and it is easier to tell when brie is ready. I also top the cheese with a little bit of the onion to give a little hint of what is inside, but again, not necessary. Cheese should be baked in wooden box bottom, on aluminum foil (in case of spills) and placed on baking sheet on center rack. Brie is ready when cheese begins to seep through scores in top of rind and the cuts begin to separate. My first encounter with Irish culture was through dance. I had moved to NY after college and a friend who had been in my college dance company, then working for an entertainment lawyer, was able to get us comp tickets to see “Riverdance.” Not just any comp tickets — the best in the house, which in case any of you are wondering, for a dance performance or musical theater, is generally front row center mezzanine, not orchestra. This (as opposed to “Lord of the Dance” which is all about Michael Flatley taking off his shirt and prancing around) remains one of my favorite shows because it gives a version of Irish history through music, song, and dance. The explanation for the posture came about mid-way through the first act when right before one number, a disembodied voice commands, “Irish dancers, stand proud!” A proud army they were, straight posture, heads high, shoulders down, feet-a-flutter. I was so excited, too, when I took a few Irish step classes and the first thing we learned was to put our hands out in front of us, palms up, fold our thumbs in, curl our fingers over our thumbs, and lower our arms to our sides. A proud army ourselves even in our mishmash of leotards, jeans, tights, and tap shoes. Wanting to make something for St. Patrick’s Day, I tried to learn a bit about the Jews of Ireland (through food of course) to find something to cook that would incorporate Jewish traditions and Irish pride. I couldn’t find any “Jewish Irish dishes” in searching through my multi-cultural Jewish cookbooks and few of my Irish Jewish friends seem to cook. I turned to Ellie, The Baking Architect, who participated in a bike trip through the Emerald Isle a few years ago to raise money for Miklat, to suggest some authentic Irish recipes, maybe made by Jews in Ireland, but she could only send me some beautifully decorated butter cookies. I have little patience for such fussiness and sweet icing (sorry, El). In looking around on the web, the main thing I found about Jews in Ireland vis à vis food is that they were traditionally involved in city life, acting as merchants and business people (surprise, surprise…), and therefore bought most of their food rather than growing it. Many Jews came to Ireland from Lithuania and Russia in the late 1800s/early 1900, so much of their food is Ashkenazi. The Bretzel Bakery, that makes traditional Ashekenazi baked goods (including rugelach) has been non-Jewish owned for decades and is no longer kosher (though apparently the non-Jewish owners did keep up with kosher certification, working with a mashgiach for several decades). So, forget Jewish…I might as well make something sort of Irish. And something that I’ll want to eat. Scones. Perfect. Plus, it’ll use up some flour before Passover (do the holidays ever end???). Adapted from Molly O’Neill’s New York Cookbook. 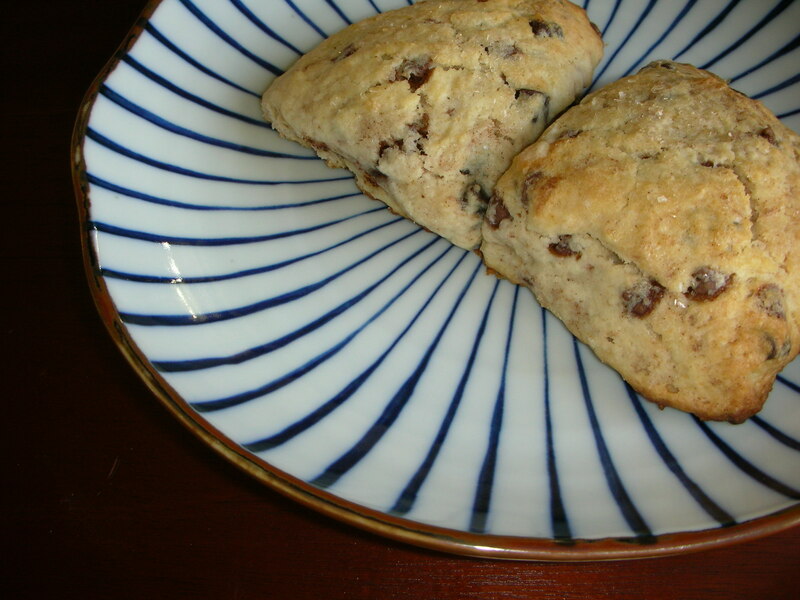 I found a Scottish scone recipe — close enough to Irish? — that didn’t call for fancy flour or buttermilk. This recipe does use a LOT of butter. 3 sticks! I’ll keep playing with some of the proportions, but this makes a really nice, moist scone that is not dry. I replaced whole milk with skim milk, increasing 3/4 C to 1 full C. Replaced raisins with cinnamon chips and chocolate chips and added some cinnamon to the batter. If you’re going to bake with butter, you might as well use Plugrá or another European style butter with a slightly higher (82-84% vs. 80-82%) butterfat content than American-style butter. The cinnamon chips (parve) I used are from Peppermill, a high-end cookware and bakeware with gourmet products. The Schokinag semi-sweet baking chunks (dairy) are available at Williams-Sonoma (thanks, Mom!) — and have a nice half-barrel shape. Really, any good chocolate chunk will do. My other alternative was to chop up some Callebaut (see the Resources page about this chocolate). Preheat oven to 400ºF. Line baking sheet with parchment (or grease baking sheet). Cut cold butter into dry mixture with pastry blender, 2 knives, or my personal favorite, your hand. Resulting mixture should resemble a course meal. cutting butter in with your hands – it gets a bit messy! Add in beaten egg and milk – stir until well combined and then knead in bowl until smooth, about 5-10 minutes. This is not a tough dough, but it is a bit sticky. Add a little extra flour as necessary. Add chips and a few dashes of cinnamon — so there are swirls of cinnamon, but not a brown dough. Refrigerate dough ~3o minutes so it is easier to handle. Option 2: Make “drop scones” with a small ice cream scooper (should be ~1/4 C). You might need a second spoon (or your hands) to get the dough out. Flatten a bit with a floured hand to 1-inch thickness (see “Option 1” for thumb measuring stick approximation). Sprinkle lightly with turbinado sugar so the scones will glisten slightly after cooking, but not so much that there will be a hard sugary crust. Repeat with rest of dough. I had to make 2 batches. Bake for 25 minutes. I had to move my first batch from the middle rack to the top rack for the last 5 minutes because the bottoms were getting a bit too dark, so check your scones after about 15-20 minutes and adjust position as necessary. One night last week, I woke up at 4 am and couldn’t fall back asleep. I tried everything. I read the New Yorker by my bed — yes … I might live in Cambridge, but I still subscribe to the New Yorker, New York Magazine, the weekend New York Times … you get the picture. I listened to my flying piggy music box. This was a gift from my dear friend Lau who lives in London and here is the picture I sent her a few years ago when the little piggy and I lived in my very NY apartment. I’ve tried to load the video so I can share the music which just adds to the piggy charm, but I’m new at this techie thing and I just can’t seem to make it work. … Despite all my best efforts, I couldn’t fall back asleep, so … I decided to bake. Now, mind you, I am NOT a baker. Baking is chemistry, and I am no chemist. That poor unfortunate soul who was my lab partner in Orgo can attest to that! But, some things are really worth the effort, and at 4 in the morning, I needed to channel my inner chemist (?!?) to focus, relax, and help me get back to sleep. So, I made espresso shortbread. Well, I made the dough and then stuck it in the fridge to chill for a few hours while I went back to sleep. Now, this might seem strange — why would I make anything with espresso in it in the middle of the night if my goal was to go back to sleep? Well, for me, coffee is less about the caffeine and more about the ritual. Don’t get me wrong, caffeine has an effect on me. But the real wake-up call is that first (and usually only) cup in the morning, the steam rising as I warm my always-cold hands on the mug full of delicious. I only drink it cold when it’s unbearably hot outside…and it’s just not the same. So, espresso is just another ingredient. Well, not just. It’s an extraordinary ingredient. And in these shortbread, it magically gives a chocolate hint. My take on baking is that if I’m going to bake, there is usually a special unique or unexpected ingredient that I want to showcase, and the experience – the process – really comes from the heart. That’s the only way I can focus enough to actually follow a recipe exactly. When I made these shortbread, I used a birthday gift from Eva, the first and fastest friend I made up here in Boston. She just gets me. My love affair with shortbread began in my early teens when I started babysitting for the same family almost every weekend. Penny was English, Medhat was Egyptian, and I cared for their three children for five years, two of them from birth. One Saturday night, soon after “Weezy” (Louise) had been born and Lilah was not yet tired of playing mommy, Penny left some fresh homemade shortbread on the counter. Now, until then my main exposure to shortbread was Walker’s. Which is good, but can not compare to the melt-in-your-mouth deliciousness that is homemade. Penny apologized for leaving things out on the counter in a mess, but was in a rush and the shortbread had to cool. She told me to help myself to a few shortbread. And help myself I did. After I put the girls to sleep. And one more story. And a glass of water. And finally silence. As any babysitter knows, this is the time to rummage around in the fridge, check out the pantry, and get a snack before settling down for an evening of homework and maybe a little TV, turned low. So, I had a bite of shortbread, plucked from the rack of now cooled little diamonds. Wow! I opened the fridge and saw a mound of dough, wrapped in plastic, and sitting in a bowl. Raw shortbread cookie dough. Enough said. I was hooked and kept stealing little nibbles by the spoonful, always carefully remolding the dough and tightly rewrapping the plastic. I couldn’t eat very much or Penny would notice. Eating some chips is acceptable babysitter behavior. But raw dough…I don’t think so. And Penny is a very proper British woman. That night when I got home, I prepared my own version of shortbread dough … to eat raw of course. I had noticed that Penny had left confectioners’ sugar out on her counter, so I found some in our pantry, mixed it with a little flour and butter, mashed it all together with a fork in a little bowl, squished it to form a nice mound and didn’t bother with the plastic because it wasn’t going to make it to the fridge. Who has time to waste? I just pinched off little bites of delicious, melt in your mouth … raw … shortbread … dough. And for years, I made that little concoction when I wanted a little something sweet. It wasn’t until I was all grown up and had my own apartment and started to entertain that it ever occurred to me to actually bake the shortbread. 1/4 C ground espresso — make sure it is ground really fine (i.e., for an espresso maker). Make the dough: With electric mixer and paddle attachment, beat margarine and sugar until creamy, approximately 2 minutes. Add vanilla and beat well. Turn to low speed and mix in dry ingredients – flour, espresso, and salt until just combined. The dough will be brownish-gray, a little sticky, and firm. Form dough into a disk, wrap in plastic wrap and chill for at least 2 hours. (It was at this point that I went back to bed at 5:30 am). Roll the dough between 2 sheets of wax paper or plastic wrap (keep the rest refrigerated) to 1/4 inch thick. I’ve never really been very good at measuring thickness — so, if you can’t measure 1/4 inch, the most important thing is to make sure that each batch you put in the oven is the same thickness so everything bakes evenly. If you’ve ever eaten Walker’s shortbread — the little sticks — I think they’re about 1/2 inch thick…so use your best judgment. Cut the dough into diamond shapes. I find that using a pizza cutter is the easiest way to get straight, clean lines. Place diamonds on Silpat or parchment covered baking sheet (recipe says to use an ungreased baking sheet, but I prefer to cover). Prick the shortbread with a toothpick in the middle and bake until pale golden around the edges, 20-24 minutes.